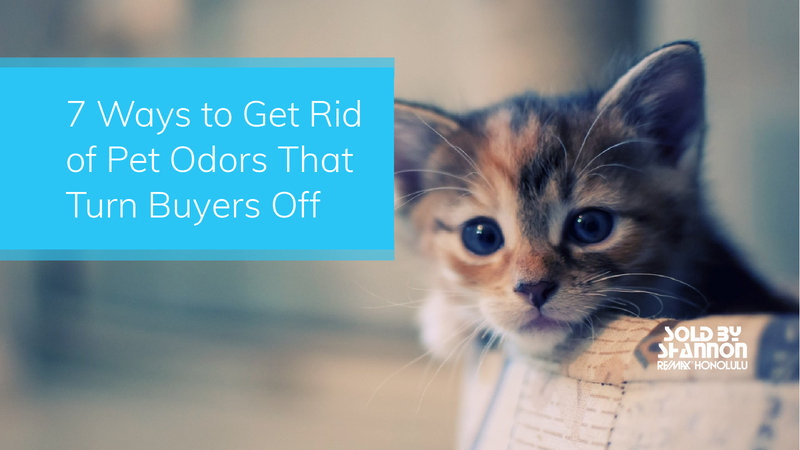 Pet odors inside your home, even if they aren’t terrible, can turn off potential buyers and make it hard to sell your home. While I am in the habit of being honest with my clients about any potential problems I see, others may not, so be sure to ask your real estate agent for their opinion. If your pet has a buddy it can hang out with while your home is on the market (and you can bear being apart from them), you may want to send your pet on a temporary vacation. Pet daycare is also an option if you don’t have any safe options available. If your pets stay home, remove them from the house well before a showing and put their toys, dishes, and litter box away. Basically, you’ll want to remove as much evidence of the pet as possible. If you have a pet that has accidents and uses a puppy pad, regularly throw used pads away outside in a trash can with a tight lid. If possible, change it after each use; don’t allow it to sit at all to keep any odors from starting. And it goes without saying, remove even clean puppy pads during a showing. Instead of just scooping, replace kitty litter daily while your house is for sale. Be sure to hide the litter box during any showing, outside if that’s an option. If you can’t leave it outside for a few hours, be sure to clean the litter box thoroughly before stowing it away. Throw open all the windows (and doors if you can) and let the fresh air in. If there’s no breeze, set up a fan or two to circulate the air through your home to sweep out any lingering pet smells. If you live in a cold area, this would be good to do too, if only briefly depending on the weather. After you’ve gotten rid of the pet odors, try to keep the smells from coming back. Crate your dog when you’re not home or keep it outside and restrict the cat to a smaller area or room of the house. Replace pet bedding and litter boxes, especially right before a showing. Use vinegar, pet odor-neutralizing products, or wood floor oil to scrub any walls, trim, and uncarpeted floors, especially if previously soiled by pets. These products are cheap, usually between $10 and $20. For surfaces that won’t damage like cement floors and walls, try a bleach solution of 1 part bleach to 9 parts water. If you have super stubborn pet odors in a large area of the home, you may have to bite the bullet and hire a professional service that specializes in removing difficult stains and odors. If your carpets are fairly well-kept you could shampoo your own carpets using a cleaning solution specifically made for pet odors. If your carpets need a more vigorous cleaning, hire a professional carpet cleaner for around $30 to $60 per room, depending on how hard the job will be and room size. For carpets that still maintain an odor after a professional cleaning, you will want to replace both the carpet and the padding. If the sub-floor was effected and you can’t get rid the smell, that will also need to be replaced. Just like cigarette smoke, pet odors permeate fabrics. Dry clean, steam clean, or launder all window coverings in your home. If you have blinds, be sure to use a bleach solution mentioned earlier to wipe them down. Have your upholstered furniture steam cleaned by a professional (about $100 for a sofa) or replace any pet soiled furnishings with rental furniture, even if it’s just for a showing. Put the icing on the cake that is your deep clean with a few scented candles or potpourri. Use just a few scent elements to add a light background scent and cover any lingering pet odors; you don’t want to overdo it to avoid turning off any buyers sensitive to perfumes. A pretty bowl with lightly scented potpourri in the entryway of your home creates a warm first impression. Add other mild scents to the other rooms using candles, fragrant oils, and even fresh flowers.